Kairos Prison Ministry – two Trinity members are involved in Kairos at the Darrington and Vance units. For more information you can visit www.kairostexas.org or www.darringtonkairos.org or www.carolvancekairos.org. 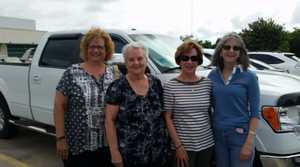 Women’s Storybook Project – four to six trained women members of Trinity join other women from Baytown/Kingwood/Houston to go to two local women’s jails on the third Saturday of every month for this literacy ministry. They help offenders pick out a book for each child they have under the age of 12. Then the offenders read the book and it is recorded on a USB drive which is then burned as an audio CD. The book and the CD are mailed to the children so they can have a connection with their mothers. This ministry is throughout the state of Texas and has been ongoing for over 12 years. It relies on grants and donations to buy the books, USB drives, computers to burn the CDs, the CDs, and postage to mail. Each offender has a chance to read 3 or 4 books to each child. For more information about volunteering or donations visit www.storybookproject.org.